Begin isn't just responsible for provisioning and managing your app's serverless infrastructure, it's also a fully integrated CI/CD build pipeline optimized for serverless architecture. Begin builds run entirely in cloud functions, so they spin up fast and run in parallel as quickly as you can push changes. 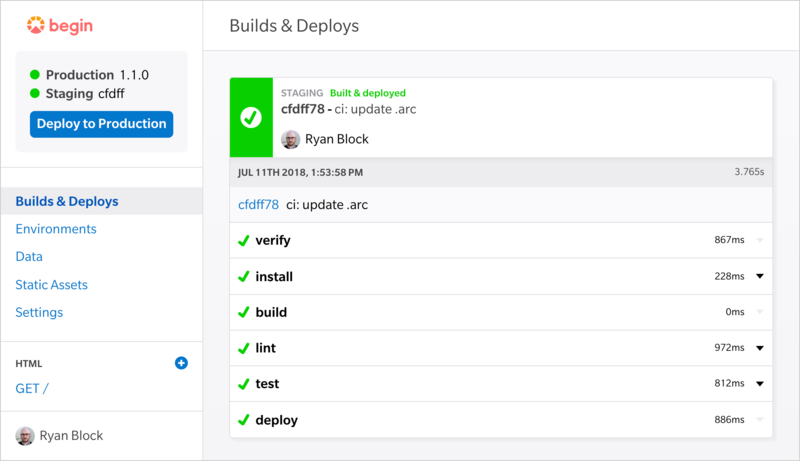 The Builds & Deploys view – your default view in Begin - shows all your app's builds, deploy status, and corresponding log data. Deploying to Begin is as simple as pushing to master or cutting a git tag. Deployments to staging and production take only seconds are instantly available at scale – enjoy the benefits of near-instant iteration with frequent pushes! Each push to master kicks off Begin CI. The last step for each green build is a staging deploy. The current running version on staging is represented by the commit SHA, and can be found in the upper left corner of Begin. git tag -a 1.0.1 -m "This release includes 20% more cowbell"
The current running version on production is represented by the version you specified in your tag, and can be found in the upper left corner of Begin. 👓 Note: We strongly encourage the use of SemVer when creating production releases! Responsible for validating the repo payload from git and prepping Begin's infrastructure for a deployment. This step is non-configurable and does not output logs. Responsible for installing dependencies via NPM to all routes (e.g. src/http/**) and shared code (src/shared, src/views). This step is non-configurable and does output logs. Note: dependencies in your project's root package.json are not available to your routes. To ensure a dependency is available to a given Function, cd into that function's folder and install it there. To install global deps, install them to shared (src/shared) – but mind dependency bloat! Routes must weigh in under 5MB uncompressed. This is a great place to generate static assets (to be deployed via the .static folder) or implement a bundler such as Webpack or Parcel. "test": "NODE_ENV=testing tape test/*-test.js | tap-spec"
Ah, the step we've been waiting for! The deploy step is non-configurable and does not currently output logs (but will in the future).